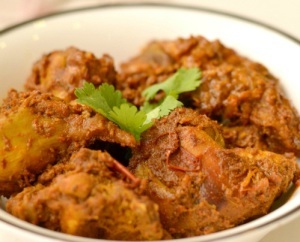 Kosha Murgi: Kosha murgi means chicken that has been slow cooked till the gravy has turned dry. Kosha murgi is a dry type chicken curry with no addition of water and should be cooked in Mustard Oil. Traditionally, a little sugar is added and caramelized to achieve the gorgeous colour of this dish. Kosha murgi is one of the star chicken recipes of Bengali cuisine. Heat mustard oil in a thick deep-bottom pan. Once the oil reaches its smoke point, let it cool. Add half a teaspoon of sugar and wait till it melts. Add in the whole spices and stir for about 10 seconds. Fry till the onions soften and turn translucent. Add in the ginger-garlic paste along with the slit green chillies. Fry the chicken on medium heat for about 5 to 7 minutes. Stir well so that all the chicken pieces are nicely coated. Add the coriander powder, cumin powder, red chilli powder, kashmiri red chilli powder and turmeric powder. Mix well so that all the pieces are coated in the spices. Add in the sliced tomato and season the curry with salt. Cover and cook on low flame, for another 5 to 7 minutes or till the chicken is done. Remove the cover and give it a good stir till whatever remaining gravy you see dries up. Remove the kosha murgi from heat. Serve the kosha murgi with hot steamed rice. If you have any queries regarding the Kosha Murgi recipe, please leave a comment.